A few weeks ago, I shared the emotional reason why we began homeschooling. Now, I would like to share the logical reasons. Once I worked through the emotions of our situation, I started doing my research to see what would be best for Beth. Should I fight for change at our public school, or should I homeschool? Our district is all-inclusive, which means it does not have any self-contained classrooms past preschool. This was something I was thrilled about when Beth first started school in 2012, but now saw as a negative, given our situation. Beth thrived in the self-contained classroom; but appeared to have had more bad than good experiences in the blended one. From kindergarten and on, she would be in a “pod classroom,” which would have 8-11 students with IEPs blended with 10-15 neurotypical students. The students with IEPs would be given 30 minutes a day with a Special Education teacher for “extra help,” but would spend the other 4.5 hours with one teacher and one aide in the pod. Having taught 4yr pre-k, and substituted in kindergarten, I could not see this ratio working for any of the kids. Being neurotypical, and without an IEP, does not mean those children will not need additional help. How could two adults possibly fulfill the needs of 18-27 students, and still provide a positive educational environment? With that question in mind, I started examining the benchmarks and kindergarten readiness skills on different sites. I realized that Beth barely had 50% of the skills suggested to start kindergarten. Although, her IEP was in place because she learned at a different rate, than her typical peers, I also realized that her achievement of IEP goals had been overstated. Perhaps they could get her to “perform” one-on-one, but overall she did not possess the skills to utilize in the classroom (or other non-school) setting. I brought my findings to her therapists (who have been with us since Beth was 2.5yrs old), and asked them for an honest opinion on her chances of success in a pod classroom. The answer was unanimous, she would fall further behind, and would not be able to reach her God given potential, given the structure of the pod classroom. They also felt that this would only add to her anxiety, self-esteem, and confidence issues. Henry and I discussed our options at length. Although he had several reservations, he supported my desire to attempt homeschooling. We also debated whether to allow Anne to remain in public school, or withdraw her too. In the end we decided that if the school was not a safe, positive environment for Beth, then it was not for Anne either. Our girls deserved more respect, and a better chance of success in reaching their God given potential, than our public school could provide. I am beyond grateful for the ugliness that stemmed from our request for help, because it opened my eyes and heart to the reality of our girls’ situation. We had put too much trust in the public school staff, and given them more power than they deserved, but that is a post for another time. “If you’re autistic, it’s not abuse. If you’re autistic, it’s not neglect. – Lydia Brown on the recently dropped charges in the case of two autistic young men locked in a basement in unimaginable conditions for years. To do everything in my power to make Lydia’s words no longer true. Disability does not – cannot – continue to be an excuse (legal or otherwise) for our society’s wholesale dismissal of the universal right to the recognition and respect of human dignity. Not in an absolute sense and not by degree. Because there is no mystical line where severity of condition, be it the challenges of autism or otherwise, cancels out humanity. Ever. So while losing ten (okay, twenty) pounds, getting more exercise, and getting outdoors more are all great resolutions, this one is at the top of my list. Please note: The comments are now unmoderated. Please, please remain respectful of one another and, above all, the victims of abuse in Lydia’s post. Also, there seems to be some confusion about the quote above. Lydia, who is a tireless autistic advocate for disability rights, does not believe that what she wrote *should* be the truth. She is stating, in the context of these horrific stories of abuse of autistic people, the reality of our society and our legal system as they stand. I read Lydia’s blog post, Black Lives Still Matter, from the link in Diary’s Facebook status, through tears. The horrific things done to these Autistic children were too much for my heart to bear; all the sadness and outrage spilled out through my eyes. Beth has many amazing friends of different nationalities, and I could not imagine these atrocities happening to one of the children I have come to love. struck a painful chord with me, because sadly she is as right about how the world sees our children, as she is about how it NEEDS TO CHANGE. Hello everyone, I cannot believe it has been 2.5 months since I wrote a post. Our family has been busy, and it is amazing how quickly time passes, when technology is taking a back seat. So what brought me to the computer today? A talk with a good friend plunged me into deep thought today. I realized that even someone who knows me so well, often does not understand my faith. Although, my friend does not always understand, she is typically supportive, but it got me thinking: How do you explain Faith? Since finding Al-Anon and building a strong relationship with my Higher Power (whom I call God), my faith has evolved. Over the years, this evolution perplexes my loved ones, and often leaves me feeling a bit lonely. I know God is always with me, but sometimes it would be nice to have a friend or family member truly understand my views. I was blessed to find a MOMs group, which the girls and I attend every Tuesday at a local church. Most of these women “get it” and it is a comfort to me. Although, they have had a healthy relationship with God most of their lives, so sometimes I am left feeling behind in their inspiring trains of thought. You may be wondering, what the point of this post is. I am not sure there is one, perhaps I just needed to see my thoughts in black and white. 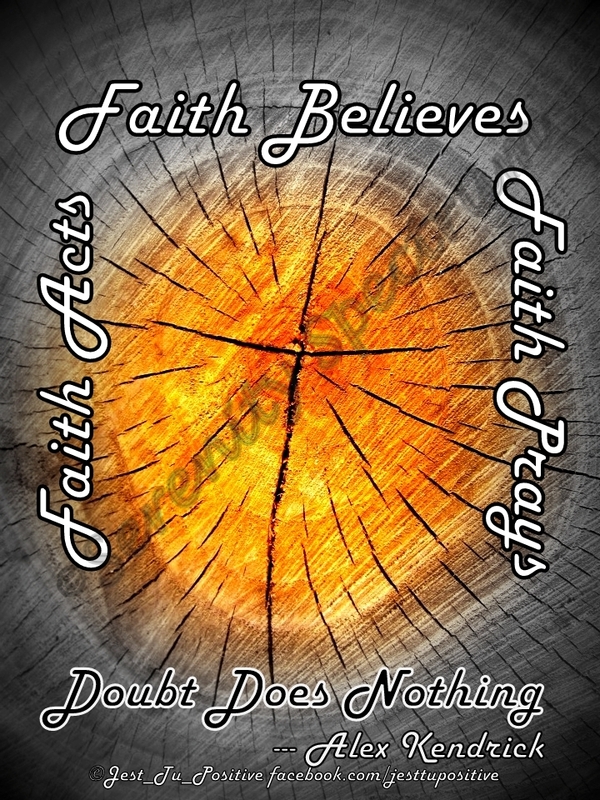 Bottom line: Do not let Doubt encroach on your Faith. When a loved one does not understand your perception or actions, it can cause you to doubt yourself, but do not let it. Your faith is simply that, YOUR FAITH, and it will lead you to extraordinary places if you walk in it every day. You do not have to understand, (or agree with) someone to love and respect them. Simply treat everyone as you would like to be treated, and be the change you want to see in the world. A mother in one of my homeschool groups shared the post below, by Emily Wierenga, this morning and it got me thinking. When the girls went to public school, I cherished the alone time,and waited until it was time for the bus, time for nap, time for bed, etc… I had gotten swept up in the “I Deserve” whirlwind, and was “Waiting Away” my children to have as much alone time as possible. I thought I longed for that alone time to be a better mom. I was wrong! Now that we are homeschooling, I find that I am no longer “Waiting Away Our Children’s Existence.” My children are a blessing, and even on our bad days, we learn so much from each other. Although, I never saw myself as homeschool mom, I am so thankful that God showed me it was the right path for us. I cherish the time we have together, and after five years, I am finally feeling like I am the mom they deserve. I can only pray that they feel the love and respect I have for them, in all that we do. Well, how can you argue with that? We had finished everything on our schedule except for Art, Games and Chores; therefore I told them to go play. I set the timer, and said when that went off it would be time for school again. They were playing so well together, I extended the timer three times before we started on our art projects. Yet again my girls reminded me that we don’t need to adhere to such a strict schedule. After all, the whole point of homeschooling is to allow them to learn on their terms. Part of the equation for success is respecting them, their opinions and their needs/wishes. When I force a schedule down their throat we are all cranky, and don’t really accomplish anything. When we slow down and do activities in their time, we have a happy and productive day. So what if my two hours of planned activities takes eight hours to finish? That is eight hours without the TV on, with us mostly playing and learning the best way (together having fun). We are only starting our third week of homeschool, but I have to say it is one of the best decisions we ever made. It has only been six weeks since we made the decision to homeschool; however, I am already tired of the questions about Socialization. Truth be told, we are more social now, that we are not attending public school, because we have the flexibility to attend events that were never an option due to school hours. Last night, Beth attended a “pajama story time” with Henry, which would not have been an option if she had to get up at 6:30am for school. This morning we went to a dance party, and will be starting a regular story time next week that will meet until Thanksgiving. These are just the activities at the library; we also have our classes (dance, swim and young athletes) with the Special Needs Recreation Association starting soon. Not to mention the Home-school Co-op we are joining. All of the above activities are meant for the girls to interact with children in their age range; however, that is just a small part of socialization. We also go shopping, visit the library staff, walk to the post office, and are starting to take trips to places where we can spend time with older people. One thing I see lacking in many children today is respect for their elders, which makes me sad. Each generation that came before us, has a unique perspective on life, that should be cherished. I was an only child, who spent a lot of time with my elders. I used to think I missed out on childhood, but I realize now that I learned invaluable lessons about life and all its intricacies, from the older people I was blessed to hang out with. Today, while shopping with my mother-in-law, we were complimented on how polite the girls were. Although they are young, they can carry on a conversation with employees at stores, restaurants, etc… They are also getting quite good at saying “excuse me” and “thank you” when they pass someone in the store. When we pay our bill, they say “thank you” and usually remember to say “have a nice day” without being reminded. Please do not worry about our socialization. We teach them to be kind, compassionate, respectful members of society; simply by taking them out in public and acting the way we would like to be treated. We lead by example, and are proud of our children’s social skills with people of all ages.